Piston Cloud Computing was one of the darlings of the OpenStack movement. A founding father of the cloud computing project, it produced one of the first private cloud products based on the open source code. Fast forward two years and founder Joshua McKenty has left Piston and the most recent release of the company’s product dropped OpenStack from its name. What used to be Piston OpenStack is now named Piston Cloud OS. Why the change? Is it a commentary on OpenStack more broadly? Consider other news about OpenStack recently: Nebula, an OpenStack startup founded by another founding father Chris Kemp, recently closed down. HP, which is pinning much of its IaaS cloud offerings on OpenStack technology, has sent mixed signals about its cloud offering in the market. To some, it seems that OpenStack is in trouble. But backers of the project insist it’s as strong as ever. 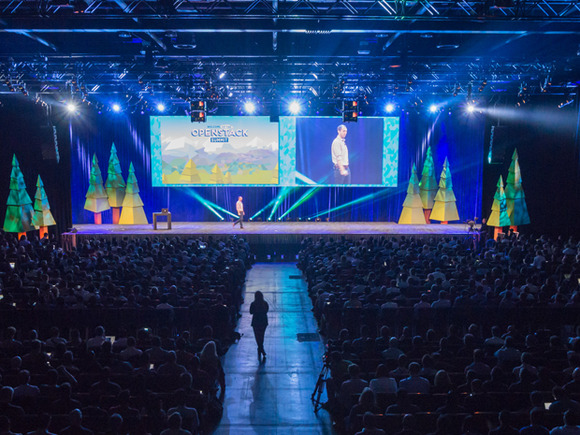 This week OpenStack is in the midst of its 11th semi-annual Summit in Vancouver. From all accounts it’s got the feel of a real tech show with an estimated 6,000 attendees and more than 500 companies supporting the project. As for the churn of startups, Chief Operating Officer of the OpenStack Foundation Mark Collier says that’s just part of the natural evolution of any technology. Not all startups make it; some pivot, some fail. Perhaps some of the hype around OpenStack has cooled, he acknowledges, but that’s not necessarily a bad thing. “That’s a natural progression when a technology goes from being a promise to actually delivering,” he says. Many analysts who track OpenStack are bullish on the project. IDC cloud and virtualization analyst Gary Chen said the project is strong. Forrester senior analyst Lauren Nelson published a report during the summit this week titled: “OpenStack is ready – are you?” and declared that its viability and presence in the market is “irrefutable.” OpenStack has become the “compatibility standard” in the private IaaS cloud market, she says. Vendors and pundits can say what they want about technology, but perhaps the best metric to use to measure OpenStack is user adoption. Some lament that there have been relatively few new user stories about OpenStack at its recent summits, but Nelson found 11 Fortune 100 companies using OpenStack for production use cases, including Best Buy, BMW, Comcast and Disney. EBay, Yahoo and EBay/PayPal have massive OpenStack installations. That’s not to mention major service providers who use the open source code to build products and services that are delivered to the market – Rackspace, HP and IBM all fall into this category. At the Summit this week, representatives from the largest brick and mortar retail company in the world spoke about how important the technology has been. The company has 11,000 stores and runs 11 e-commerce websites, which served 1.5 billion page views during last year’s holiday period. The advent of customers buying merchandise on their mobile devices and expecting fast delivery meant that the company needed a technical back end that would be flexible and had the ability to scale out. After a variety of proofs of concepts, WalmartLabs landed on OpenStack a few years ago. The fact it’s an open source project gives Senior Director of Cloud Design Amandeep Singh Juneja peace of mind; he did not want to use proprietary APIs. Walmart is now running a 140,000-core installation of OpenStack, and it’s growing. In her research Nelson interviewed many users and vendors to get a sense of how organizations are using OpenStack. Jesse Proudman, Founder and CTO of Blue Box, which offers a hosted private cloud version of OpenStack, says OpenStack has emerged as the open source alternative to proprietary cloud platforms, such as Amazon Web Services, Microsoft Azure, Google and VMware. Nelson said the open source nature of the project creates a perception that it will prevent against vendor lock in and mitigate expensive licensing costs. That may not always be true, but OpenStack Foundation is trying to make it a reality. At the Summit this week the foundation announced the launch of a marketplace of OpenStack “certified” cloud providers who offer cloud-based virtual machines and storage that have met interoperability standards. There are currently 11 vendors participating including IBM, HP, Rackspace, VMware, Blue Box, Mirantis and others. Theoretically users could launch services to multiple different public IaaS clouds powered by OpenStack using similar API calls. This “build once, deploy anywhere” mentality that Nelson described has been a major driving factor for many users. Like any technology project there are things to watch out for, Nelson warns. First of all, it’s important to remember what OpenStack is and what it’s not. It is a series of components that can be used to build a cloud, including compute (named Nova), storage (Cinder) and network (Neutron) functionality. The code is free, but deploying OpenStack from the trunk code is not the most likely consumption model. It would be analogous to taking the open source Linux code and running an OS off of it. Higher-level functionality like management and automation are still nascent in the project. To help, many vendors have created distributions of the code and provide support. Other vendors offer hosted private cloud or public clouds based on OpenStack. 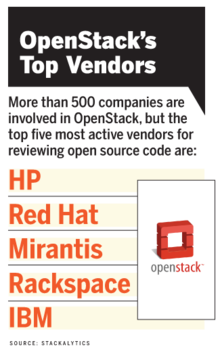 There are more than 500 companies involved in OpenStack from Red Hat to Mirantis, which offer distributions of the code, to IBM, Rackspace, HP, Cisco offering hosted versions of it. Deploying any cloud project – whether it’s OpenStack or a public cloud like AWS – is a significant undertaking for any large organization. To get real value from an OpenStack private cloud requires buy-in from top-level executives, a team of architects, operators, and infrastructure teams to run it and developers who will use it, Nelson recommends. OpenStack is growing fast, which is good because it allows the project to keep up with new developments like containers and data center orchestration technologies like Mesos and Kubernetes. But it also means the project has a new release every six months, which has led some organizations to fall behind on upgrades, or just not attempt to stay current on the releases, even with advances that have made rolling updates easier. Some users also say there are not as many integrations with legacy systems as there could be. OpenStack has come a long way from its earliest days as a compute system developed at NASA and a storage platform from Rackspace in 2010. It’s not a panacea – but it is certainly a viable option.